EVERGLADES CITY, Fla. — When thinking of the Everglades, the first thing that comes to mind is most likely the Florida alligator. Mosquitos, swamp-land, and birds are probably second, third and fourth. But the Everglades are so much more than that. They are a serene but simultaneously wild habitat for hundreds of species, and a place that changes from mangrove forests to open water in only a few short miles. The Everglades are a Florida treasure that few Floridians visit, but there are so many reasons why they should. 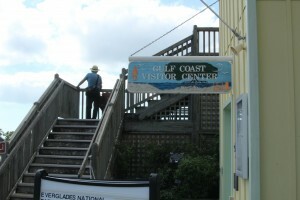 A visitor to the Ten Thousand Islands looks out to the Gulf from the Visitor Center at Everglades National Park Boat Tours (Photos by Veronica Lopez). On a tour of the Ten Thousand Islands by Everglades National Park Boat Tours, visitors get a close look at the wildlife that surrounds the Ten Thousand Islands, including the mangrove forests, hundreds of bird species and a visit from a pod of dolphins- the fan favorite. Tours depart daily from the park’s Gulf Coast Ranger Station on the causeway linking Everglades City and Chokoloskee Island, every half hour from mid December through mid April, and every hour from mid April through mid December. 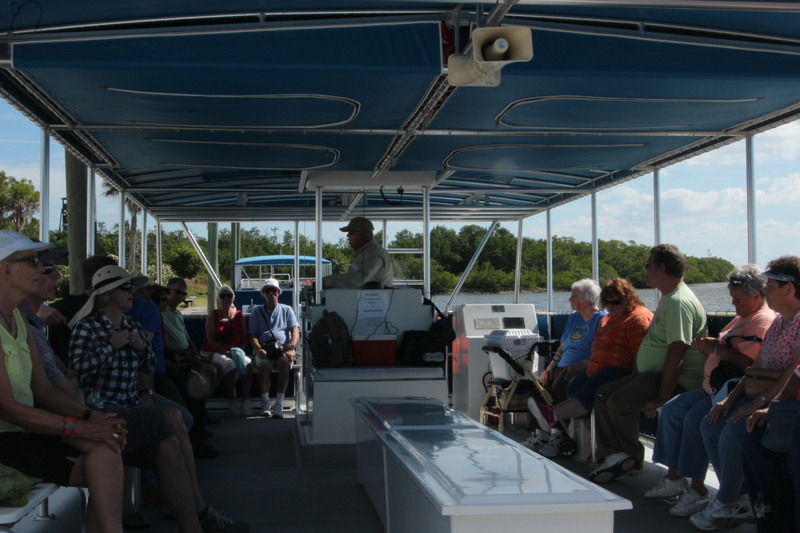 For $30 per adult, visitors get the chance to see dolphins, roseate spoonbills, eagles, alligators, sea turtles, stingrays, and maybe even a manatee or two in their natural habitats. 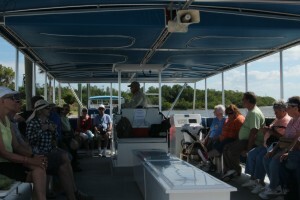 A tour by Everglades National Boat Tours led by Capt. Steve ready to depart. People come from all over the world to visit the Everglades, including Rebecca Shrijver and her boyfriend Sander van Tongeren from Utrecht, Holland. Self-described nature fans, the couple were on vacation in Florida for six weeks and thoroughly enjoyed everything the park had to offer. 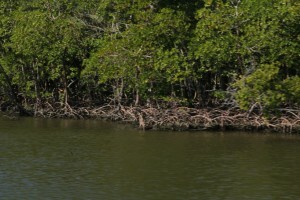 The Ten Thousand Islands would not be such a good habitat for marine animals without mangrove roots. In fact, they would not even exist without them. The roots are what hold the islands together. Leaves and other organic material collect within the roots, which builds up the land. The roots are what keep the soil from washing away, and they give small fish and crabs protection from their predators. Mangrove forests make up the bulk of the Ten Thousand Islands. Filter feeders like barnacles and oysters live on these roots, and during the summer months their roots anchor the mangrove forests. This provides the first line of defense against the winds and storms of hurricanes. Capt. Steve has been a captain for 35 years and has been working for Everglades National Park Boat Tours for four years. The passion he has for the nature around him is obvious from the moment you step on board for one of his tours. Once a resident of West Palm Beach, he moved out to Everglades City for the quiet that it offers. He was going to retire, but said he is having too much fun. 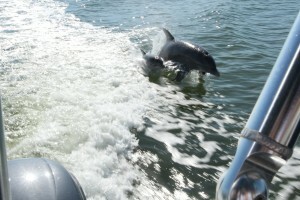 A baby dolphin and his mother jump up to play in the wake of the tour boat. It’s easy to think that the Everglades don’t have much to offer besides mosquitoes and alligators. But if people can go visit from the other side of the world, then Florida residents should absolutely take advantage of the unique habitat that is only a short drive away. How to get there: Start at 8th Street, which is the same as Tamiami Trail. Take the trail all the way West until you get to Everglades City. The Everglades National Park entrance is at the end. Last tour departs at 5 p.m.